William Shatner is a Canadian and an Emmy Award-winning actor who became most famous for portraying Captain James Tiberius Kirk of the starship Enterprise. But there is much more today’s guest than his career in the Star Trek franchise. Shatner’s 2004 cover version of Pulp’s Common People produced by Ben Folds from his underrated Has Been album is still one of my all-time favorite cover versions and many are unaware that he is also a New York Times Bestselling author. But despite an iconic career, it’s his involvement the world of tech startups that is possibly the biggest surprise. Back In 1997, Shatner teamed up with travel discount site, Priceline.com. Priceline’s Nasdaq listed stock (NASDAQ: PCLN) has traveled from approximately $16.00 for the initial public offering, to $1840 more recently where it rests with a US$90 billion dollar market cap. Maybe we shouldn’t be too surprised to hear that William Shatner is now back on the startup scene with LottoGopher. LottoGopher is disrupting the lottery industry for Americans. Essentially, LottoGopher is a lottery messenger service that allows users to easily order and manage their state lottery tickets online using a debit or credit card. By allowing individuals to choose their numbers and safely order tickets for the official lottery drawings in California, LottoGopher makes it simple for users to keep track of their tickets and winnings. 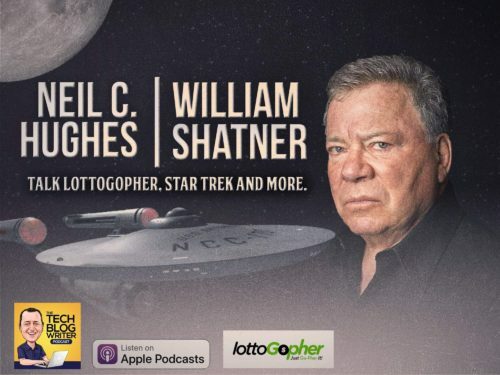 I chat to William Shatner about his iconic career, his love of technology, LottoGopher and another project around twitter called Ubuntu. So this is the part of the show where I usually beam your ears to another part of the world so you can hear today’s guest, but today I’m going to do something a little bit different. It’ll be rude not to say this so Scottie beat me up because it’s time to speak with the one and only legendary, William Shatner. Greetings and salutations from the UK Mr.Shatner and a warm welcome to the show. William Shatner: Ok, how long would the UK last with the Brexit thing do you think? Neil: We don’t mention the B-word, we can never mention the B-word, it’s too soon. William: Then we would stick to the L-word. Neil: [Laughs] I love it. Can I begin by saying your 2004 cover version of Pulp’s Common People produced by Ben Fold is still one of my all-time favorite cover versions, do you enjoy recording that album? William: Oh, it was so much fun and that is one of the great numbers I don’t know really what it means, the original was so beautiful that you didn’t mind that you didn’t understand what the hell he was talking about, but it was like the Christmas cake in Mc Carther park, but it’s a beautiful musical thing and I felt challenged but and I had a good time doing it and I know it was sold to some advertisers, unbeknownst to me but that’s another story. Neil: What I love about you though is that you are a renaissance man in every sense, I mean there’s so much to you than James T Kirk. You’ve got an iconic career in TV, movies, a recording artist, a New York Times bestselling author, but was this all part of your master plan or did you just open yourself up to opportunities along the way? William: Yeah, there’s no master plan. You learn at the age of 12 that every plan you make is like war, once you’re into life, the plan goes a skew and you’re just doddering along trying to stay upright. Neil: This is a tech show, there are going to be a few people listening thinking it’s great William Shatner on the show but what’s the tech angle, I mean you were involved in the world of tech startup before it was even seen a thing? William: But Neil, I don’t need to tell you but the revolution is going on in the social media and that everything is changing on how you buy things and if you rent your film from Netflix and you order your cab, London just Banned Uber from working there. Uber has destroyed the taxi industry because it’s so convenient and so cheap, and now you come along and you get a Lotto Gopher where buying your lottery ticket is online, I mean it’s a revolution you know. When I read about it, when they offered this opportunity to be a part of this new thing happening, it resonated with me and that’s why I’m part of it. Neil: I was going to say, you must always get bombarded by companies wanting to work with you, I’m curious, what grabs your attention and makes you want to invest your time in a project like Lotto Gopher? William: I guess the word resonating, it feels good, I mean everybody wants to be a millionaire instantaneously, they buy a ticket, they want to be a millionaire and against all the odds they buy a ticket and every so often lightning strikes. Now you can avoid going down to the sleazy corner store and stay in the security of your home and take your chances. It’s an extraordinary jump in technology to be able to select your number and select everything you want online, in fact, this morning, I just bought something online, I needed a dog run and I was going down to the store in Los Angeles and you can order it and delivered to your home, which is what I did this morning. So everything is evolving and Lotto Gopher is at the top. Neil: So right what you’re saying, there’s no Kodak, there is no blockbuster video anymore is it? Just shows you how that the world is evolving thanks to technology. William: And I don’t know how old you’re Neil, but for me you have to will yourself to go with the changes because the human tendency to cling to the past and the future is in folding us more quickly than we can imagine. Neil: Absolutely, well I’m a man of a certain age and just in my middle age. You are so right what you’re saying that is you do cling on to the past, you don’t want to be the guy that’s resistant to change, that doesn’t want to move forward and that’s one of the things I love about you, because you just throw yourself in there, don’t know you? I mean you’re also a big hit on Twitter. William: Well, it’s part of the adventure, I’ve got some books out there now that are doing well, a book on horses and the science fiction novel, but I’m in the middle of finishing up a book on aging and the premise of the book is I can’t tell you anything, I mean I don’t know anything so I cannot tell you anything. All I can tell us what works for me and maybe it will work for you and so given that premise what works for me is jumping into things and seeing what happens. Neil: Yeah, and that’s what we did as kids, isn’t it? You know we didn’t over think things back then, its only as you become older you become more cautious and less open to things. William: Exactly, and failure was not an option was the phrase, but failure is an option, you learn by failure and you can’t avoid failure, so don’t be afraid of it. Neil: Yeah, and I was chatting to a guy I know a couple of weeks ago and he said to me I don’t fail, I learn, and that’s also a line that resonates for me too. William: But that’s exactly right. So here is a Lotto Gopher, a brand new way of doing what is been around for quite a while, buying a lotto ticket but it’s a brand new way of doing it and a rather than being offended to buy it, jump in go for it. Neil: Ah… I see what you did there, now would you be bringing your much-loved sense of humor to Lotto Gopher marketing efforts too? William: I think so, I just finished an online, I hate to use the word commercial, an online informative piece of film and hopefully it’s done with some fun. Neil: Speaking of film, I mean your sense of humor really shines to on Twitter, do you ever find yourself having to rein in that mischievous side sometimes, knowing that everything you say is going to be shared thousands of times all over the world? William: Yes, you know again, talking about new things, all the bitter, evil, black things that are said on Twitter, there are a giant wave of people of the opposite, I sense that there is a large number of people on Twitter who want to do good. As a result of what I’m forming an online, a social media event or continuing charity called Ubuntu. I want to organize Twitter so that you can give $1, $10 to your neighbor who might have a need and I’m setting up that organization and trying to get Twitter, the company to help as well as people to monitor the validity of a person saying I need some help. There are many examples, not enough time to do that here of people who want to help other people at expressing that desire on Twitter and I’m trying to organize that emotion into something more concrete that uses social media as a whole new way of helping people. Neil: And what better way for Twitter to actually manage that image problem they have got at the moment with the dark side? William: That’s exactly right Neil. Neil: So there has been a few Star Treck anniversary recently with the 50th anniversary where you visited Birmingham NEC here in the UK last year and of course Star Treck 2 the wrath of Kahn and of course the first VHS film I ever rented, so looking back, how do you feel about the franchise now, and do you still enjoy meeting fans at those conventions? William: You know I go every so often to, they are calling them comic con and I’m in fact coming to the UK for the love of sci-fi in Manchester on the 2nd and 3rd of December. Neil: Fantastic, I wanted to ask you a question from my childhood, so indulge me if you may. Can you offer any insight and knowledge about how many takes it took Heather Locklear to perform that throwing a police baton to take down a crook move because I’ve tried many times with my friends as a kid and I never got there? William: I stayed the day working with her, very beautiful young girl, needed a lot of help, we all trie to help her, put our arms around her, we gave her advice you know it was a good day’s work. Neil: Now before you go, from one tech guy to another, I’ve got a speech for you, now imagine a SAT NAV system were drivers can navigate to the sound of your voice and we call it the Shat NAV, can we make it happen, I’m open to take only 20%. William: Brilliant idea, 20% is too much. Neil: [laughs] well a big thank you for coming on today, before I let you go can you just remind the listeners of where they can get lotto gopher website? William: Where can they sign up for Lotto Gopher? Go to lottogopher.com like the way I change my voice, it sounds feminine. Neil: You’ve proved that you can be clever, successful with a diverse range of work but not afraid to laugh at yourself or be a little bit silly and you’re incredibly down to earth, and I think it that’s what is possibly your biggest talent, so a big thank you for coming on the show today. William: It’s a pleasure to talk to you, thank you so much, take care now. Dare you enter Shatner’s World? I love this show even though I dont understand a lot of the tech stuff. Neil hughes has a brilliant way of talking the clever stuff in the way that the layman can understand. I cant recommend this show enough. Without a doubt Mr Hughes is the NUMBER one podcaster in the UK and will take this show to the highest levels.